Addy KL, Gold AJ, Groffman PM, and Jacinthe PA (1999) Ground water nitrate removal in subsoil of forested and mowed riparian buffer zones. Journal of Environmental Quality 28(3): 962 970. Barrett KR (1999) Ecological engineering in water resources: The benefits of collaborating with nature. Water International 24(3): 182 188. Bischoff JM, Bukaveckas P, Mitchell MJ, and Hurd T (2001) N storage and cycling in vegetation of a forested wetland: Implications for watershed N processing. Water, Air, and Soil Pollution 128(1 2): 97 114. Brazier RE, Heathwaite AL, and Liu S (2004) Scaling issues relating to phosphorus transfer from land to water in agricultural catchments. Journal of Hydrology 304(1 4): 330 342. Brusch W and Nilsson B (1991) Nitrate transformation and water movement in a wetland area. Nitrogen and phosphorus in fresh and marine waters. Project Abstracts of the Danish NPo Research Programme. Copenhagen: Milj0styrelsen. Burt TP and Pinay G (2005) Linking hydrology and biogeochemistry in complex landscapes. Progress in Physical Geography 29(3): 297 316. Delgado JA, Shaffer M, Hu CGS, et al. (2006) A decade of change in nutrient management: A new nitrogen index. Journal of Soil and Water Conservation 61(2): 62A 71A. DillahaTA, Sherrard JH, Lee D, Mostaghimi S, and ShanholzVO (1988) Evaluation of vegetated filter strip as a best management practice for feed lots. Journal of the Water Pollution Control Federation 60:1231 1238. Fetter CW, Jr., Sloey WE, and Spangler FL (1978) Use of a natural marsh for wastewater polishing. Journal of the Water Pollution Control Federation 50: 290 307. Forman RTT and Godron M (1986) Landscape Ecology. New York: Wiley. Fortescue JAC (1992) Landscape geochemistry retrospect and prospect 1990. Applied Geochemistry 7(1): 1 53. Garten CT and Ashwood TL (2003) A landscape level analysis of potential excess nitrogen in East Central North Carolina, USA. Water, Air, and Soil Pollution 146(1 4): 3 21. Gburek WJ and Sharpley AN (1998) Hydrologic controls on phosphorus loss from upland agricultural watersheds. Journal of Environmental Quality 27(2): 267 277. Gergel SE, Turner MG, Miller JR, Melack JM, and Stanley EH (2002) Landscape indicators of human impacts to riverine systems. Aquatic Science 64(2): 118 128. Glazovskaya MA (2000) Denudational aggradational patterns of the soil cover as the manifestations of pedolithogenesis. Eurasian Soil Science 33(2): 114 126. Gustafson A, Fleischer S, and Joelsson A (2000) A catchment oriented and cost effective policy for water protection. Ecological Engineering 14(4): 419 427. Phosphorus budgets for two contrasting grassland farming systems in the UK. Soil Use Management 14(supplement S): 160 167. Heathwaite L, Sharpley AN, and Gburek WJ (2000) A conceptual approach for integrating phosphorus and nitrogen management at watershed scales. Journal of Environmental Quality 29(1): 158 166. Hefting M, Clement JC, Dowrick D, et al. (2004) Water table elevation controls on soil nitrogen cycling in riparian wetlands along a European climatic gradient. Biogeochemistry 67(1): 113 134. Hill AR (1996) Nitrate removal in stream riparian zones. Journal of Environmental Quality 25(4): 743 755. Isachenko AG (1973) Principles of Landscape Science and Physical Geographical Regionalization, 311pp. Carlton: Melbourne University Press. Johnston CA (1991) Sediment and nutrient retention by freshwater wetlands: Effects on surface water quality. Critical Reviews in Environmental Control 21: 491 565. Jordan C and Smith RV (2005) Methods to predict the agricultural contribution to catchment nitrate loads: Designation of nitrate vulnerable zones in northern Ireland. Journal of Hydrology 304(1 4): 316 329. Kadlec RH and Knight RL (1996) Treatment Wetlands, 893pp. New York: CRC Press. Knauer N and Mander U (1989) Studies on the filtration effect of differently vegetated buffer stripes along inland waters in Schleswig Holstein. 1. Information: Filtration of nitrogen and phosphorus. Zeitung der Kulturtechnik und Landentwicklung 30: 365 376. Koo BK and O'Connell PE (2006) An integrated modelling and multicriteria analysis approach to managing nitrate diffuse pollution. 2. A case study for a chalk catchment in England. Science of the Total Environment 358(1 3): 1 20. Koskiaho J, Ekholm P, Raty M, Riihimaki J, and Puustinen M (2003) Retaining agricultural nutrients in constructed wetlands Experiences under boreal conditions. Ecological Engineering 20(1): 89 103. Koskiaho J and Puustinen M (2005) Function and potential of constructed wetlands for the control of N and P transport from agriculture and peat production in boreal climate. Journal of Environmental Science and Health A 40(6 7): 1265 1279. Kovacic DA, David MB, Gentry LE, Starks KM, and Cooke RA (2000) Effectiveness of constructed wetlands in reducing nitrogen and phosphorus export from agricultural tile drainage. Journal of Environmental Quality 29(4): 1262 1274. Kronvang B, Grant R, Larsen SE, Svendsen LM, and Kristensen P (1995) Non point source nutrient losses to the aquatic environment in Denmark: Impact of agriculture. Marine Freshwater Research 46: 167 177. Kull A, Kull A, Uuemaa E, Kuusemets V, and Mander U (2005) Modelling of excess nitrogen in small rural catchments. Agriculture Ecosystems and Environment 108(1): 45 56. 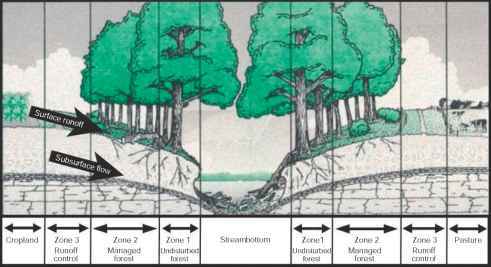 Kuusemets V and Mander U (2002) Nutrient flows and management of a small watershed. Landscape Ecology 17(S.1): 59 68. Leser H (1997) Landschaftsökologie (in German), 4th edn., 644pp. Stuttgart: Ulmer. Lesta M, Mauring T, and Mander U (2007) Estimation of landscape potential for construction of surface flow wetlands for wastewater treatment in Estonia. Environment Management 40: 303 313. Likens GE and Bormann FH (1995) Biogeochemistry of a Forested Ecosystem 2nd edn., 195pp. New York: Springer. Lilly A, Ball BC, McTaggart IP, and Horne PL (2003) Spatial and temporal scaling of nitrous oxide emissions from the field to the regional scale in Scotland. Nutrient Cycling in Agroecosystems 66(3): 241 257. Magette WL, Brinsfield RB, Palmer RE, and Wood JD (1989) Nutrient and sediment removal by vegetated filter strips. Transactions of the ASAE32(2): 663 667. Mander U, Hayakawa Y, and Kuusemets V (2005) Purification processes, ecological functions, planning and design of riparian buffer zones in agricultural watersheds. Ecological Engineering 24(5): 421 432. Mander U, Kull A, Kuusemets V, and Tamm T (2000) Nutrient runoff dynamics in a rural catchment: Influence of land use changes, climatic fluctuations and ecotechnological measures. Ecological Engineering 14(4): 405 417. Mander U, Kuusemets V, Lohmus K, and Mauring T (1997) Efficiency and dimensioning of riparian buffer zones in agricultural catchments. Ecological Engineering 8(4): 299 324. Strategies to counter a persistent ecological problem. BioScience 51(5): 373 388. Mitsch WJ and Gosselink JG (2000) Wetlands, 3rd edn. New York: Wiley. Mitsch WJ and J0rgensen SE (eds.) (1989) Ecological Engineering: An Introduction to Ecotechnology, 472pp. New York: Wiley. Naiman RJ (1994) Watershed Management: Balancing Sustainability and Environmental Change, 560pp. New York: Springer. Neef E (1961) Landschaftsokologische untersuchungen als grundlage standortsgerechter landnutzung. Die Naturwissenschaften 48: 348 354 in German. Parn J and Mander U (2007) Landscape factors of nutrient transport in temperate agricultural catchments. In: Brebbia CA and Katsifarakis K (eds.) WIT Transactions on Ecology and the Environment, vol. 104: River Basin Management IV, pp. 411 424. Southampton, UK: WIT Press. Perelman AI (1975) Landscape Geochemistry (Geohimiya Landshafta; in Russian), 235pp. Moscow: Wyshaya Shkola. Peterjohn WTand Correll DL (1984) Nutrient dynamics in an agricultural watershed: Observations on the role of a riparian forest. Ecology 65: 1466 1475. Pionke HB, GburekWJ, and Sharpley AN (2000) Critical source area controls on water quality in an agricultural watershed located in the Chesapeake Basin. Ecological Engneering 14(4): 325 335. Polynov BB (1956) Selected Works, 495pp. Moscow: Akademia Nauk SSSR (in Russian). Roth NE, Allan JD, and Erickson DL (1996) Landscape influences on stream biotic integrity assessed at multiple spatial scales. Landscape Ecology 11(3): 141 156. Schwer Cb and Clausen JC (1989) Vegetative filter treatment of dairy milkhouse wastewater. Journal of Environmental Quality 18(4): 446 451. Silvan N, Vasander H, and Laine J (2004) Vegetation is the main factor in nutrient retention in a constructed wetland buffer. Plant Soil 258(1 2): 179 187. Sochava VB (1978) Vvedeniye v ucheniye o geosistemakh, (in Russian), 318pp. Novosibirsk: Nauka. Solntsev AN (1949) O morfologii prirodnogo geograficheskogo landshafta. Voprosy Geografii 16: 61 86 (in Russian). Tiemeyer B, Kahle P, and Lennartz B (2006) Nutrient losses from artificially drained catchment in north eastern Germany at different scales. Agricultural Water Management 85(1 2): 47 57. Troll C (1971) Landscape ecology (geoecology) and biogeocoenology: A terminological study. Geoforum 8: 43 56. Tunney H, Coulter B, Daly K, et al. (2000) Quantification of Phosphorus (P) Loss to Water Due to Soil Desorption. Wexford, Republic of Ireland: Environmental Protection Agency. Vannote RL, Minshall CW, Cummins KW, Sedell JR, and Cushing CE (1980) The river continuum concept. Canadian Journal of Fisheries and Aquatic Science 37(1): 130 137. Verhoeven JTA, Arheimer B, Yin CQ, and Hefting MM (2006) Regional and global concerns over wetlands and water quality. Trends in Ecology and Evolution 21: 96 103. Vymazal J (2001) Types of constructed wetlands for wastewater treatment: Their potential for nutrient removal. In: Vymazal J (ed.) Transformations of Nutrients in Natural and Constructed Wetlands, pp. 1 94. Leiden, The Netherlands: Backhuys Publishers. Grundwasserlandschaften der alten Bundeslander (BRD) 8 (in German). Julich. Germany: Forschungzentrum. Young RA, Huntrods T, and Anderson W (1980) Effectiveness of vegetated buffer strips in controlling pollution from feedlot runoff. Journal of Environmental Quality 9(3): 483 487.